Multiple use water services (MUS) is an approach for planning and designing water services that addresses not just one aspect of people’s water needs – such as drinking or growing crops – but the range of people’s domestic and productive water needs. Winrock International is implementing the MUS component of the USAID WA-WASH program and simultaneously supporting the value-chain for water-related products and services so that Burkinabé clients will have access to affordable water solutions adapted to their context, not only now but long into the future. International as a local service provider who could be trained and equipped to provide water solutions to clients, addressing their needs for both domestic and productive water. 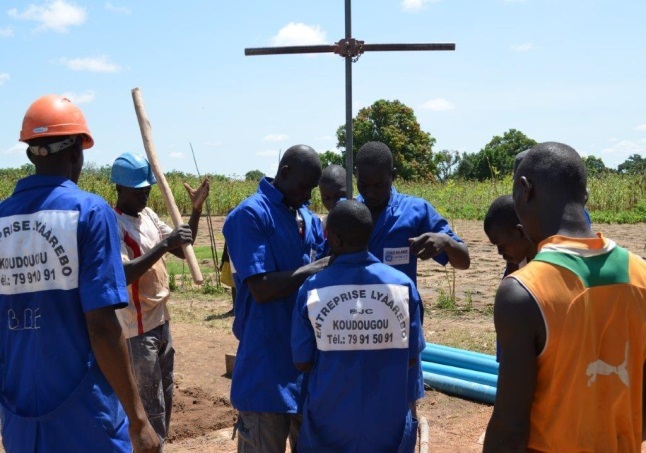 Only six months later, in October 2013, the Lyaarebo enterprise has drilled 20 boreholes inside existing wells in the Koukouldi area. On top of these upgraded wells, Mr. Bado’s team has installed pumps and concrete covers. At an average rate of one borehole per week, Mr. Bado’s team has improved the quantity of water (important for productive uses such as gardening), the quality of water (important for drinking and health), and year-round reliability of water (important for both domestic and productive needs) for his clients. The USAID WA-WASH program is facilitating market development through demonstration sites of these affordable water solutions. Mr. Bado has begun increasing the size of his team in anticipation of increasing demand from clients. 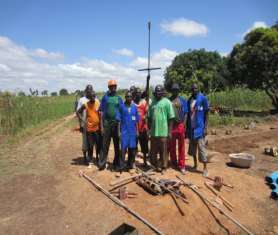 He has recruited and trained six interns and is adding a second set of drilling equipment. and potable water for good health. These low cost technologies meet clients’ needs for multiple uses of water for small livestock, building businesses, growing gardens, and drinking. The Lyaarebo team with founder Mr. Bado (green shirt), employees (blue uniforms), and interns. quality drilling services to his clients, ensuring that a broken pump is immediately fixed. Understanding that women often initiate family investment in water solutions, Mr. Bado meets with community women to advertise his products. Second, Mr. Bado provides additional value to his clients. For example, he suggests how to divert runoff water from shower rooms, how to improve groundwater recharge around the well with soil dikes, and how to dig through difficult laterite soil to make holes for fruit tree planting. Finally, Mr. Bado’s business benefits from the relationship and trust he builds with his employees. For example, he encourages his employees to open a savings account and he provides credit to assist with large investments, such as motorbike purchases. As a result, Mr. Bado says that more and more young men approach him for employment opportunities. These young men have seen the positive behavior change of Lyaarebo’s employees as they become more responsible. They also see an opportunity to earn an income at Lyaarebo Enterprise and invest it in inputs to increase vegetable production in their gardens. sustain their businesses and continue to reduce the work load of their clients by providing them with appropriate low cost technolgoies, for years to come.